Table saws are often the cornerstone of a solid woodshop. Comprised of a heavy-duty circular saw and table assembly, table saws can be used for many different types of cuts and project needs, making them among my favorite power tools of all. It seems like every tool company has a table saw of some sort out on the market now, so there are plenty to choose from. Looking for the best table saws? You’re in the right place. 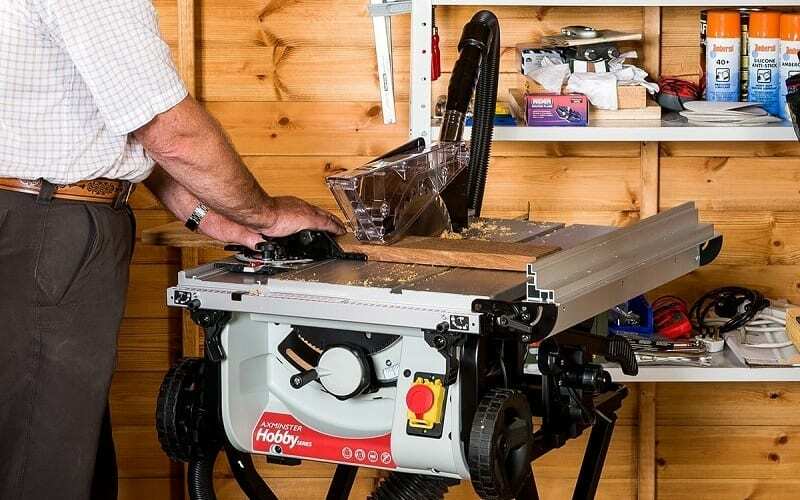 Below, I’ve handpicked six of the best table saws for 2018, in a few different categories. I’ll start with the three best job site table saws, and go from there, and then end with some helpful tips for making sure you pick the right table saw for you. I think it’s safe to say that table saws have definitely come a long way over the last few decades, as manufacturers are continually figuring out ways to implement a number of features and capabilities into portable job site table saws that were unheard of even just a few years ago. Job site table saws are usually somewhat large to an extent but used to lack some helpful features that were more reserved for cabinet table saws permanently set up inside shops and garages, but thankfully that’s not how it is anymore. Job site saws are portable versions of cabinet saws now, meaning both hobbyists and contractors can spend a few hundred dollars, and end up with a beast of a table saw that can pretty much do it all, while still being easy to pack up and move when needed. The DEWALT DWE7491RS is a prime example of this. The DWE7491RS is the ultimate ally on a job site, whether that means on someone else’s property, or simply your own. It’s packed with features, has the unrivaled sawing capability, and is insanely easy to move around despite its size and stature. It has a somewhat surprising price as well, which is a nice bonus. Most table saws are used for ripping the majority of the time, and the DWE7491RS is more than equipped for the task. With a 26-¼ inch X 22-inch table surface size, you have more than enough area to fully support huge workpieces, while keeping them stable and secure. The DWE7491RS uses a 10-inch blade, which offers 3-1/8 inch depth of cut at 90 degrees and 2-1/4 inch at 45 degrees. A quick-action lever provides fast adjustments on the blade’s exposed height, so you’ll always have a smooth cut for any size. You’ll have a hard time finding workpieces this thing can’t handle. The railing system of the DWE7491RS is one of its main strengths. The telescoping railing quickly extends out, giving the DWE7491RS a whopping 32 ½ inches of ripping capacity, certainly ideal on an actual job site. Narrow cuts can be facilitated by flipping the rip fence over. Power is at a premium with the DWE7491RS, thanks to a smooth and efficient 15 amp motor driving the blade. You’ll have no issue with softer woods or harder woods like pine, getting that same smooth and easy cut regardless of what you throw at it. And while the DWE7491RS isn’t full of flashy features, it still comes with some nice inclusions, such as an onboard storage system for the Guide-Pro and push sticks, along with a transparent modular blade guard that can be locked in within a matter of seconds. There’s a lot to love about the DWE7491RS, but aside from the sheer power and workpiece capacity, I dig the quick setup and portability. It can essentially fold down to a somewhat compact size, which is then transported by the rear wheels and a pull handle within the stand. Roll it in, lock in each leg, and turn the table over to stand it up on each leg and you’re all set. The only real drawback is the lack of accessories, such as a dado blade. You’ll have to purchase a separate kit and plate if you want to make these cuts, but fortunately, it won’t set you back too much money on top of things. Overall, this is by far the best job site table saw for the money, and even if it had a higher cost I’d still probably choose this one over others. The DEWALT DWE7491RS is a force for professional contractors, but certainly not out of place in a hobbyist’s shop or garage. This should be at the top of your list. As I mentioned earlier, table saws intended for the job site are a lot more feature-laden than ever, but this doesn’t automatically mean every newer model is on the futuristic side. With that said, the Bosch 4100-09 seems to be geared towards the user who does, in fact, want some of the flashier features and inclusions. Bosch has earned a reputation for making some of the best and most heavy-duty tools around and has long been a favorite among professionals. The 4100-09 has the same quality you’ve come to expect from the company while implementing some very smart and helpful features to go along with its contractor job-readiness. The 4100-09 may not have the large statue of some of the other job site table saws out there, but it can go toe-to-toe with practically any other model, and outdo many of them in ease of use, especially when it comes to how smooth and simple it is to guide workpieces through. With a 29 x 21-1/2-inch square tabletop, the 4100-09 has a standard 25-inch rip capacity and can extend up to 40.5 inches when working with sheet good. This size should be plenty enough for the average contractor, and most certainly spacious for the home user working on weekend projects. As expected, the saw blade capacity is 10 inches, and it can make bevel cuts between -2 and 47 degrees, and also dado cuts up to 13/16-inch. The assembly is compatible with ⅝ arbor sizes, so you’ll have no trouble using other blades when needed. Also, the included 40-teeth blade is very impressive for a stock version. The railing system is noteworthy. The saw uses a SquareLock Rip Fence with auxiliary fence slots and a t-slot miter gauge, so it’s able to easily glide along the rail for some of the easiest one-handed cuts you’ll ever make. Adjustments are no problem, and everything feels incredibly secure. As for what drives it all, the 4100-09 comes equipped with a 4 HP motor that cranks out 3,600 no-load RPM. You’ll notice the power when you’re one-handing a dense workpiece, and the 4100-09 doesn’t even budge or kickback at all. Now for the other fun features. On the blade area itself, a riving knife is present so it can keep materials from pinching on the blade, and it and has upright, splitting and non-thru cut options. Constant Response Circuitry keeps speed constant under load, and a Soft Start provides a smooth ramp up speed. On the side of the table, the 4100-09 has a digital screen that shows you precise measurements as you slide the fence, with markings along the side as well. I have no idea why more manufacturers don’t include this simple and very convenient little feature. I love this saw because it would already be just fine with its basic setup and features, but the fence system, digital screen, and riving knife are just cherries on top of a gourmet cake. I like the smaller size of the saw body too, and the included stand and rollers are easy to use and set up. No real complaints here, but I do wish the table surface size was just a little bigger. I like large table sizes though, and the provided space should be fine 99% of the time. The Bosch 4100-09 is awesome; there’s no way around it. I have it as a runner-up, but I can see why some buyers will prefer it to the DEWALT DWE7491RS due to the array of smart innovations and features. The prices are similar to, so you can’t go wrong either way. Looks can be a little deceiving with table saws at times, as the smaller job site models can sometimes seem a little inadequate for handling large workpieces, so simply holding up to the rigors of frequent transport and use. Rockwell is a company that often figures out ways to put out smaller and sleeker versions of typically larger tools, without sacrificing any capability or versatility. As an owner of more than a few Rockwell products, it’s no surprise that the RK7241S does exactly that. 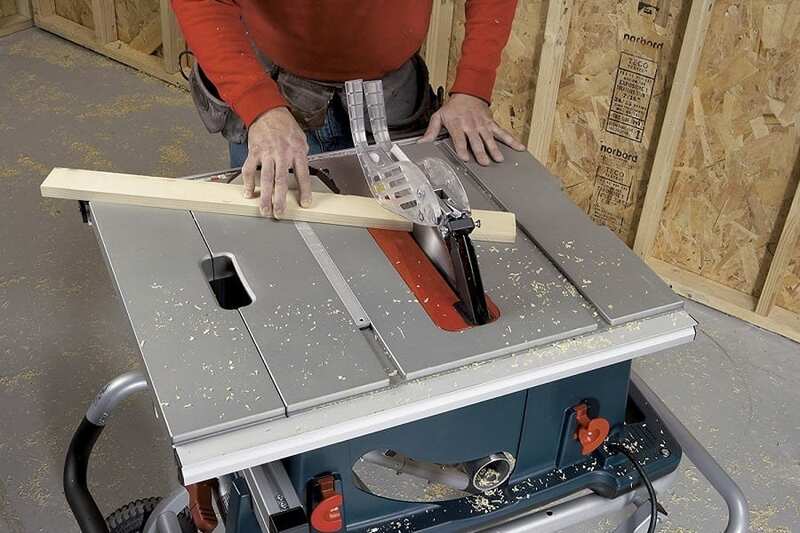 Smaller, a little more compact, and offering performance that meets or exceeds many table saws almost double the price, the RK7241S is one of the best buys in the table saw world, and provides a level of cutting any contractor, or serious DIYer will take notice of. Although the RK7241S seems a little small at first, the table size and rip capacity are one of the best in its class (10-inch blade table saws, to be clear.) The table size of 28 ½ inches x 19 inches is adequate enough, but the 30-inch fold-out extender is what makes it all come together. 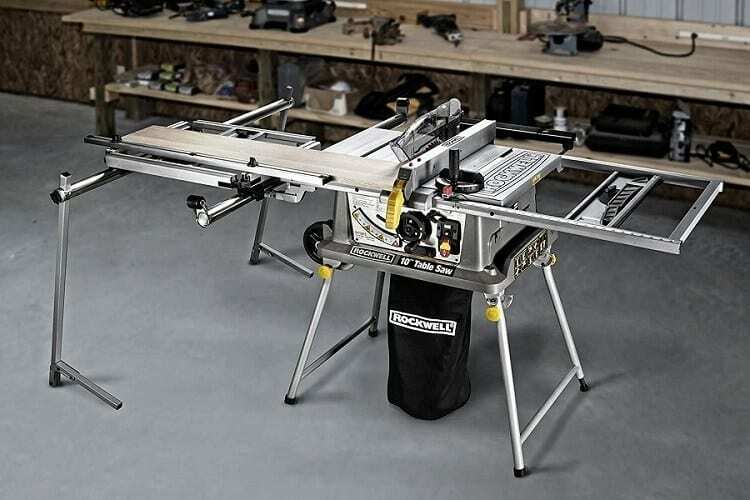 The 30 inches of ripping capacity is up there with the big boys, and this can be increased with a number of available accessories from Rockwell, including an entire table extender that can still work with the included miter gauge. Worthy of the cost increase, for sure. The RK7241S holds its own in the power department as well, as a 15 amp motor keeps the blade spinning at 4,600 RPM through various load sizes with ease, and helps make quick and smooth work out of practically any workpiece size and material. This table saw is the typical 10-inch blade size, but the strategic design of the RK7241S gives it the biggest cutting capacity in its class, allowing it to slice all the way through a 4 x 4 workpiece, while some competitors fall just short. The saw’s maximum cutting depth is 3-9/16 inches at 90 degrees and 2-9/16 inches at 45 degrees. As for extras, the RK7241S has a lot to offer. One of the best features is the laser guide that seamlessly moves with the blade as it bevels, taking the guesswork out of those often difficult angled cuts. I love this laser, and it doesn’t need fine tuning all the time like some other saw’s versions. A dust bag is included as well, which attaches right under the middle of the saw on the ground. This is much preferred over having to bring a vacuum and hook it up on a job site, and I wish more job site table saws would include a bag for that very reason. A push stick and riving are included too. I’ve touched on this already, but I do appreciate the smaller size of the RK7241S. The extended fold-out fence and efficiently-sized table make up for it, and the motor is more powerful than several other larger models. Setup is a breeze too, and the integrated trolley/stand is easy to transport. My only real complaint is the lack of true dado cutting ability. You’ll be better with a larger and more capable table saw if you anticipate the need for dado cuts on a regular basis. Rockwell has outdone themselves again, making the RK7241S one of the top table saw purchases on the market. This saw is built for worksites and makes a fine addition to any home shop or garage setup thanks to its smaller size. It’s also the most affordable job site table saw on this list, so if you’re trying to save some money, this is a great way to do it. Compact table saws are more or less just shrunken versions of job site table saws, but these days, they are now expected to offer a very comparable level of performance and capacity. So, think job site table saw, only smaller. The DEWALT DWE7480XA offers the same type of performance you expect out of other DEWALT products, just in an easier to transport package that is more apt to fitting under that shelf in your garage or tucked away into a corner in your shed. While this table saw may not be the workhorse that it’s bigger brother the DWE7491RS is, it isn’t that far off in a lot of ways. In fact, I have a feeling that most contractors will be perfectly satisfied with bringing this table saw to a job site, as long as there aren’t huge workpieces to deal with. I’ll start with some of the size specs. The DWE740XA’s table size is 26.5 x 25.8 x 17.5 inches, which is not too far off from larger models. The surface size offers a right amount of stability when working with wider pieces, and certainly enough to guide smaller pieces along. Like most every table saw now, the DWE740XA has an extendable fence, which gives it a maximum rip capacity of 24 inches -- not too bad for a compact. The fence is easy to use and quickly snaps in place. 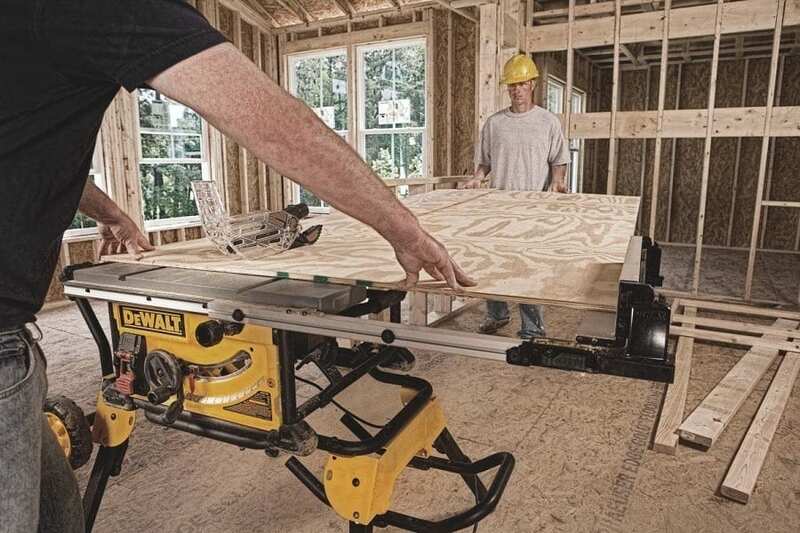 And like other DEWALT table saws, the DWE740XA comes with a Site-Pro Modular Guarding System that lets you make tool-free adjustments of the guarding components appropriate on the fly. As for power and saw size, these are not what you’d expect from a compact table saw. With 15 amps going into the motor, the saw works off of 4,600 RPM, so you’ll have no trouble at all when slicing through practically any type of wood and allowable size. The DWE740XA uses a ⅝ arbor with 10-inch blades, so you’re getting the same performance of full-size job site table saws. You’ve also got 0 to 45 degrees of bevel angling at your disposal, which means you’ll get 3 ⅛ inches at 90 degrees, and 2 ¼ inches at 45 degrees. 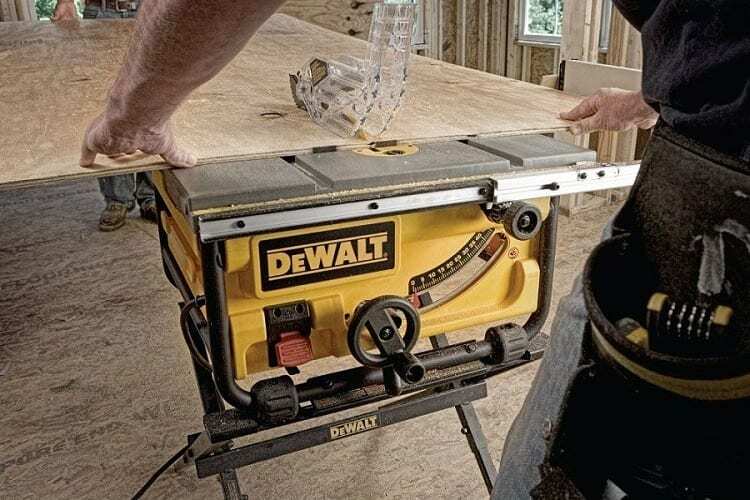 Most DEWALT table saws aren’t big on extras, but this one does have a few to mention. For one, you get onboard storage of accessories like the Site-Pro parts, and also the push stick. A dust port is available for vacuum hose connecting, and the table has a special coating to reduce friction on your workpieces. This is a compact table saw after all, so it needs to be on the lighter side of things in regards to weight. The DWE740XA sits at just under 48 pounds, which is enough to get by in this instance. It has a low profile when off the stand, so storage is fairly easy, as is setup and teardown. It would be nice if the stand had rollers of some sort, but on the bright side, hauling around a 48 pounds table saw on a regular basis is a good way to build those arms up, right? In all seriousness, if you’re using this around your home, the lack of mobility isn’t an issue. Again, DEWALT has put out a high-quality table saw that’s not flashy or all that innovative, but is well built, very powerful, and extremely reliable for years to come. In a compact table saw, that’s all you can ask for, so it gets the top pick designation. Craftsman can be hit or miss with their tools, so I always approach with caution with the more expensive ones (as in, anything pricier than a drill.) You can rest assured I’m this way even more so with saws. Compact saws don’t necessarily have to be scaled down versions of full-sized saws, cramming last bit of performance ever into an undersized frame. This is most assuredly Craftsman's view, as the Evolv is perfectly compact, and doesn’t overstep its boundaries. That’s not to say this saw is a pushover; far from it. The Craftsman Evolv is an ideal compact saw, since it’s small, lighter, and knows its limits. The result is a saw that doesn’t have much a footprint whether or not it’s set up is still fully capable of doing hard work, and won’t hurt your bank account when you buy it. The table size of the Evolv is a little on the small side, but that’s how it has to be for a true compact. The key is having ways to maximize that space. The size of the Evolv’s table is 25 x 17 inches, which is formed by opening the side of the table with the rip fence attached, giving it a 25.5-inch rip capacity overall. The rip fence itself is easy to use and lock in, with full measurements lining the sides of the table. On the other side is a miter gauge that is simple to work as well. The overall capacity and miter angling are impressive and very much adequate for being a true compact model. On the power end of things, the Evolv delivers. A 15 amp motor powers the blade assembly, ensuring top-rated RPM that makes for smooth cuts with little effort, and plenty of one-handed sawing actions when needed too. This is full-size power trapped in a compact table size. The same goes for the actual blade. The Evolv uses a ⅝ arbor setup with a 10-inch blade, the same you’ll find on bigger models. This gives it a solid cutting capacity of 3 inches at 90 degrees and 2.5 inches at a 45-degree angle. Not bad at all. Although it has a very economical price, the Evolv still comes with all the typical modern features of a contractor level table saw, including a blade guard assembly, pawls to prevent kickback and out of control workpieces, and of course a push stick to keep your hands safe. This saw takes up a very small amount of space, and only weighs about 50 pounds, and is very quick and easy to get set up from a compact state. The stand is included with this particular purchase and comes recommended, but you can also use this as a benchtop saw in your shop without any issues at all. The only real drawbacks are the usual things you’ll encounter with a compact table saw, such as a smaller rip capacity, less stability, and just a more compact workspace to deal with in general. No flashy options or accessories either, and the miter angler can be cumbersome at times. Still, the Craftsman Evolv is an amazing buy for the price. 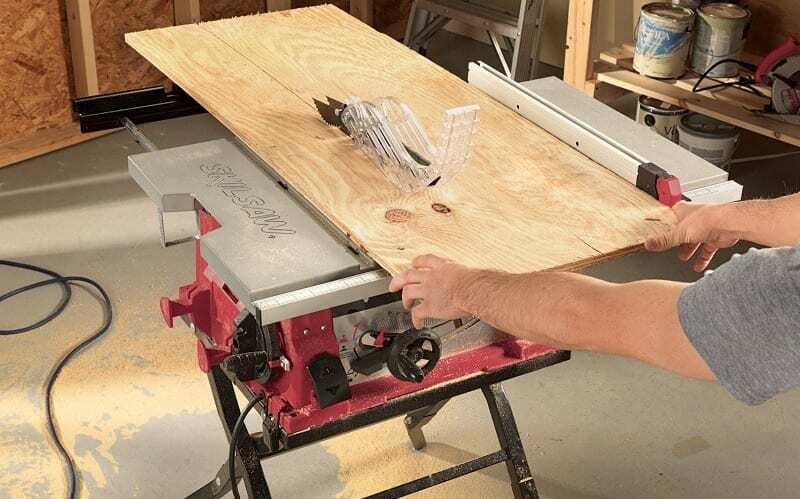 It’s one of the most affordable saws on the market and makes it easy for the average homeowner or DIYer to access a capable and powerful table saw they can keep around for small and mid-range products. If you’re looking to spend the lowest amount of money, and don’t need a huge rip or saw capacity, I’d give the Evolv some strong consideration. So here’s a first. Are you familiar with worm drive saws? If you know anything about conventional circular saws, you know that worm drives provide some distinct advantages that many serious DIYers and contractors prefer. 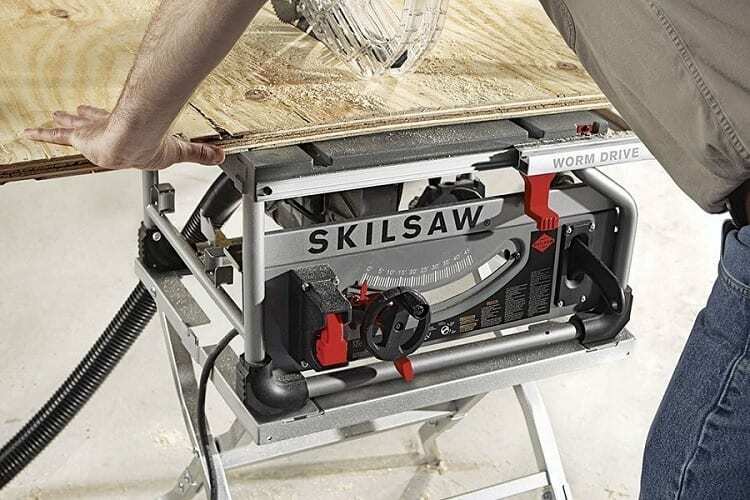 SKILSAW is a well-known manufacturer of some very high-quality worm drive circular saws, so it’s no surprise that they decided to be the first ones to use that technology in a table saw. You get all the worm drive benefits, combined with one of the best table saw builds on the market -- and in a portable package. The SKILSAW SPT70WT-01 is an easy choice for the best portable table saw, but it’s features and advantages go well beyond using a strategic drive system. This is an exceptional table saw in every way, and it certainly doesn’t feel or perform like a portable version. And that’s a good thing. I’ll start with the size since this is a portable table saw. The work surface spans 23.4 inches x 19.9 inches, more than enough to accommodate larger workpieces, and comfortable enough for more intricate work and bevels with smaller pieces. When set up, you get 25 inches of rip capacity with the fence. Not the biggest capacity in the table saw world, but this is a portable version after all, so it’s definitely good enough and should suit most of your needs as an average user, or even contractor. Now for the power part. The SPT70WT-01 runs off of 15 amps, generating a very efficient 5 HP. This is made even better with the worm drive mechanism, which allows the blade to spin with a massive amount of torque while keeping the engine cooler during long uses. The results speak for themselves. Run a hefty piece of lumber through the blade, and you’ll notice how effortless the cut is, and how stable the workpiece remains. I don’t know why there aren't more worm drive table saws; it makes a huge difference in terms of cut quality and ease. The SPT70WT-01 uses the typical ⅝ arbor size and has the typical 10-inch blade. This gives you 3 ½ inches of cutting depth at 90 degrees and 2 ¾ inches at a maximum 46-degree bevel angle. Again, not on the level of a full-size table saw, but definitely more than enough. As expected, the SPT70WT-01 comes with all the standard extras, including a blade cover, anti-kickback device, push stick, wrenches, insert blade, etc. The saw is made from steel for the cage portion, with aluminum on top, helping it keep the weight down to about 49 pounds total. The strengths of the SPT70WT-01 mainly reside with its adequate cutting capacity combined with the worm drive system. If you’ve used a worm drive saw before, you know the smoothness in which it makes cuts, and never seems to get bogged down with denser materials. They are truly a joy to use. My only real complaints are the lack of a stand with the SPT70WT-01. You can easily get one for about $80 more, so it’s not like you’ll drain your bank account, but it would still be nice if it came with one. On a positive note, you do have the freedom to mount the SPT70WT-01 on whatever bench or worktop you'd like, so some won’t mind. If you’re looking for a portable saw that does not shy away from doing heavy duty work with moderately sized pieces, the SKILSAW SPT70WT-01 is the best portable table saw for the money. And even though it’s smaller, it definitely is equipped to handle demanding job site work, and obviously most any home project. Why Is Table Saw A Perfect Add-On For Your Workshop? When putting together a tool inventory for your workshop, it can be fairly difficult to determine the saws and related tools you need the most. There are several different power saws you can acquire, as you’ve probably noticed on this site. I know that many reading this would ideally have every type of power saw at their disposal, but I know this isn’t exactly feasible for most. Therefore, it’s best to figure out which saws you should get first, and which can come later. In my opinion, a good table saw can often be the cornerstone of your workshop, and I strongly recommend making it one of the first non-handheld saws you purchase, if not the first. Table saws can be used to make a number of different cuts, and have the all-important ability to quickly rip larger pieces of wood down to smaller ones, and often with the most accuracy and ease of use. Sure, you can rip wood with a bandsaw, but the process is a little harder, and less reliable unless you’re highly skilled. Table saws can make several different types of cuts, such as the aforementioned rip cuts, bevel cuts, and miter cuts. And again, these are typically much easier and more efficient on a table saw. So, with that said, table saws are the perfect choice for making the three most basic cuts on your wood workpieces, while still being able to handle larger workpieces and tasks, and also cut smaller pieces. One of the best parts of a table saw is how easy it is to use. You don’t need to spend weeks mastering it, or watching countless videos. If you are inexperienced with power saws, it won’t take you long to get the hang of a table saw. Because of their straightforwardness, it’s simple to figure out ways to better use your table saw, even if it's just for a smaller project, or cutting down a few 2x4’s. If you like simplicity, a table saw is as simple as it gets apart from handheld saws. Since table saws offer so many different uses and are almost always portable for the average buyer, you can get your money’s worth out of them, especially if you’re using one in place of several other types of saws. For instance, if you’re thinking it’d be a good idea to have both a handheld circular saw and table saw if you get a portable table saw, you can do 90% of what you’d do with a handheld version. Furthermore, if you don’t plan on having to do freehand sawing for intricate shapes and curves like you would with a band saw, a table saw may truly be all you’ll need. Table saws have a few different aspects, characteristics, and specifications that you should be aware of prior to purchasing. Determining these beforehand will make your buying process a lot easier and much more efficient. This is one of the first specs you’ll need to narrow down. Are you looking for a table saw that you can take with you on a frequent basis, one that you pack up every now and then, one you can keep tucked away in the garage when not in use, or one that is a permanent setup? If you’re in need of a more portable model, a compact table saw or ordinary portable table saw is the best choice. If you plan on keeping it set up most of the time but still want the option to transport it without much trouble, a portable version is best. 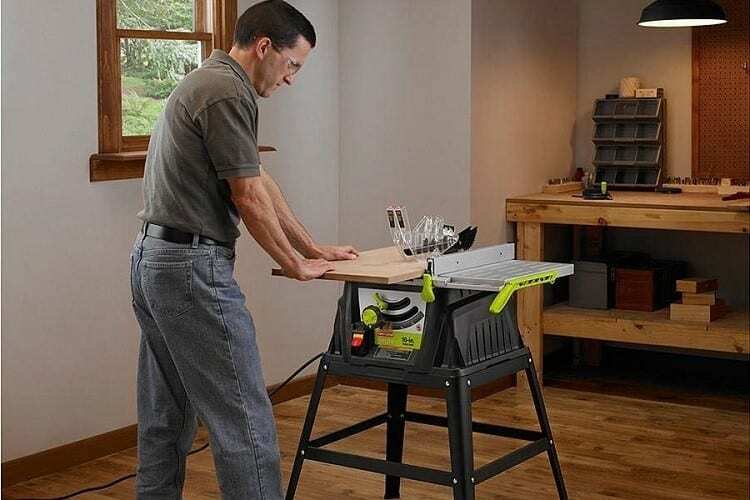 Smaller types like a compact table saw are obviously portable as well, but they are also generally smaller and can be compacted and put away in smaller space when not in use, so these are good if you lack space. Cabinet table saws are permanent versions that require a lot of space to set up. These have the most power and largest sawing and rip capacity, but they are only suited for larger, commercial-type shops, so I didn’t include any on this list. Are you shopping for table saws because you need a simple tool that can quickly rip lumber and trim large workpieces down without much effort? Or are you looking for a more advanced model that has a ton of extra features, and offers more sawing capability. Most novice users won’t get too fancy with a table saw, so having a lower-powered smaller version with less capacity is usually best. However, if you’re on the professional side of things, or plan on using the table saw for multiple projects with diverse needs, you may want to consider more expensive models that have more features, larger sizes, and more power and capability. For the most part, a lot of table saws in the standard price and skill range have comparable amounts of power, but there are definitely some that come with a noticeable amount of power and torque. Smaller projects are fine with table saws with average power, but if you want the smoothest cuts possible, and plan on working with harder materials, you’ll want to look at models that have a higher amperage and horsepower, or a more capable drive system, like the SKILSAW SPT70WT-01. These are two of the most important specs. Rip capacity refers to the maximum size of a workpiece that you can fit onto the table surface and alongside the rip fence. This is generally about the width of the piece. 32 inches is considered a very impressive amount for rip capacity, with the more average size being 25 inches. Cutting capacity refers to the height of the cut the saw’s blade can make in one pass. So, if you have a workpiece that’s 3 inches tall, and have a cutting capacity of four inches, your table saw will cut all the way through that workpiece with an extra inch to spare. Most table saws have a 10-inch blade, but not all have the same cutting capacity due to the overall design. Always be sure to check this double. Saws that can make bevel cuts will list the cutting capacity at the max bevel range as well. Most table saws come with the same level of adjustments in regards to altering the rip fence size, but not all offer equal adjustments to the bevel and miter angles. If these are going to be important to you, make sure you go over the specs first. Table saws aren’t the flashiest power saws around, but there are still a number of extra features you’ll see from time to time, such as a dust bag, blade guards, laser guides, onboard storage, telescoping legs, digital measurements, and so on. Table saws are one of the most useful saws you’ll ever buy, and in my opinion are a must for the serious DIYer. Any of the table saws listed above in this guide will make an excellent addition to your shop, or even be the core of your woodshop’s tools. All you need to do is make sure you’ve figured out what your needs are, and how much you’re willing to spend. From there, you should be able to find a perfect table saw that will provide you with many years of use for all of your project needs. Good luck!